One of the easiest of the species Tulips to grow, Tulipa kolpakowskiana is also very attractive. It has been in cultivation for over 150 years, and in good conditions it will naturalise in the garden with few problems. The flowers are a golden yellow when open. In bud the flowers show a carmine reverse on the petals which gives then extra appeal at this stage. Originally from Turkey through to Afghanistan, this is a species that copes well with hot summers, as long as drainage is good it is very easy care. 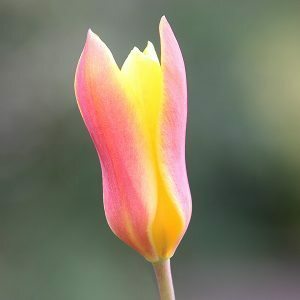 Plant Tulipa kolpakowskiana in small clumps in the garden border, let them naturalise into a lawn, or grow them in containers. This is bulb that is not fussy about position as long as it is sunny. This wonderful little Tulip opened and closes its petals with the sun. In the early morning it will present like a bud. As the sun warms it up, the petals open to reveal a starry yellow flower on a stem to around 20cm in height. Best planted in a sunny position in a well drained soil. Consider planting small clumps of 10 – 15 for a good effect. Bulbs are best planted in autumn at around 7 cm deep. Flowering time is early to mid spring. Fertilise immediately after flowering with a liquid seaweed fertiliser. Top dress with blood and bone and a little Seamungus, or Dynamic Lifter. Sold from autumn through to early winter. Plant immediately. 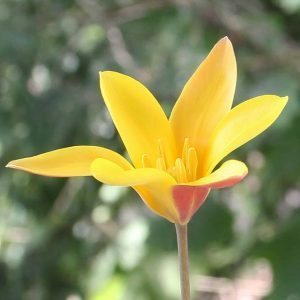 Tulipa kolpakowskiana is available for sale from the following participating nurseries.